A family owned business since 1952 in Portland, Oregon, specializing in the repair and restoration of vintage tube radios from 1930 through 1970. The level of repair depends on your expectations for the radio. A radio can be repaired to working condition by replacing only the bad parts that are found at the time of service. (This is cheaper than a full restoration, but the radio may not work as well as it could and usually will need more repairs sooner than later). Typically the recommended method. With this service the radio will be repaired and include: replacing all Electrolytic and tubular capacitors. Out of tolerence resistors changed, weak tubes replaced, controls and switches cleaned, I.F alignment performed, speaker re-coned if necessary. 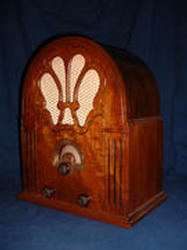 Now that your radio is in good working order, its time to bring the radio cabinet back to life. 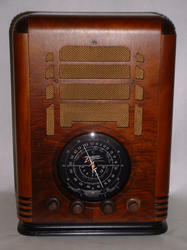 In the 1930's and 1940's, radio's not only served as a way to be connected to the world. They were also incredible pieces of furniture. Decades of bumps, scratches, water stains from flower pots, cigarette burns, storage in a damp envirnment (basement, garage, shed) can take its toll. A few small dings and dents can add character. But too many can distract from the overall enjoyment of displaying your radio. When this happens, stripping and refinishing the cabinet will make the radio the focal point of any room you display it in. Take a look at the before and after page to see what can be done with a distressed cabinet. Cabinet repairs include: glueing and clamping loose joints and veneer, replacing or patching missing veneer, stripping the cabinet of its original finish and using Mohawk toning laquer and clear laquer to bring the cabinet back to its original luster. TV, VCR, DVD, Tube and solid state guitar & bass amps, Tube & solid state stereo equipment, Xbox 360, Sony PS/3, Sony PSP, Wii. Need a vintage radio schematic? Email or call in your brand and model #. John F. Rider Perpetual troubleshooters Manual schematics are available at $5.00 for the 1st page, and $2.00 for each additional page for the same model. Payment by Paypal using burltv@msn.com will get your copies in the mail the quickest. Or, you can send a check to the address on the contact page if you're not in a hurry. All repairs include a 6 month warranty on parts & labor for the service(s) performed. Your radio will have a 6 month parts & labor warranty for the service that was performed. If the radio has a problem other than what it was originally serviced for, the radio will be repaired for the cost of parts only (this applies to full chassis restoration only). If the radio was serviced for simple chassis restoration, additional labor costs will also apply. You will be responsible for the cost of shipping to and from the shop.